The author of this delightful book, one of America's most distinguished writers, states that it is "A History, a Story, and a Memory of the Last Plains Frontier", and it follows this subtitle exactly. The "History" is that of the country around the Cypress Hills in Saska, the "Story" a fictional tale of cowboys and cattle in the terrible winter of 19067, the "Memory" the author's nostalgic account of his boyhood in the town he names "Whitemud". 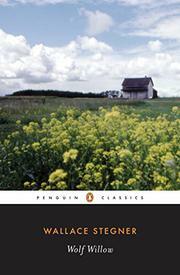 In 1914 the author's family, following the American dream of a Garden in the West, migrated from town to Whitemud, then barely born, in southern Saskatchewan, and took up a homestead exactly on the Montana-Canadian border, living there and in Whitemud. Five years later, defeated by drought and poverty, they moved on again; years afterward the author returned to find memory in the smell of the Wolf Willow that grew in the Whitemud streams of his boyhood and through it to recapture the past. Life in Whitemud and in the homestead shack was primitive and ugly, but he learned much from it; loneliness and hunger, the joys of treasure-hunting on the town dump, the fact that "anyone, starting from privation, Is spared getting bored". Of Whitemud's history he learned nothing, for although the nearby Cypress Hills had seen every stage of frontier life the town cared nothing for the past, and he knew nothing of fur-traders or Indians seeking sanetuary; he was barely aware of the Mounties, the half-breed metis, the cattle-men ruined in the winter of 1906. This book, one to be read slowly, savored and re-read, will appeal to those with the West in their bones and to searchers for the vanished frontier in its not so-distant reality.